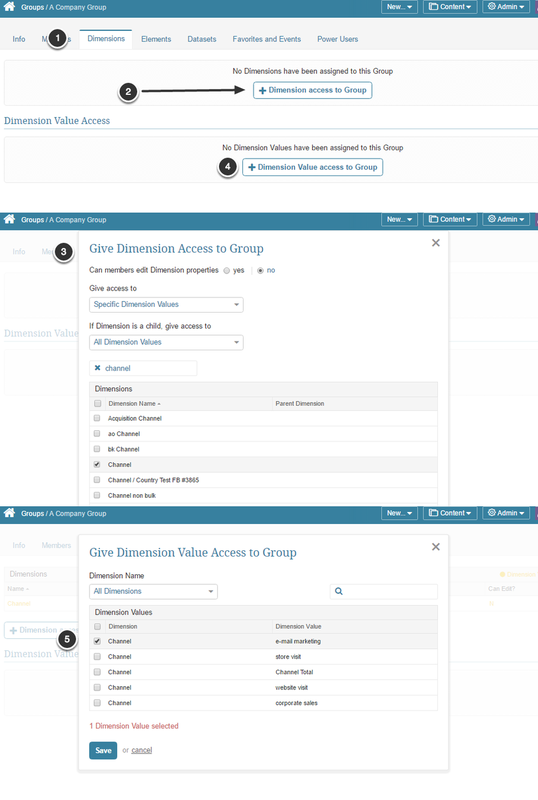 The ability to grant element View or Edit Access to Groups to which the Power User belongs and other members of those Groups. Privilege to Create Content using Existing Metrics and Single Existing Report. If the element is sourced from a SQL database or Plugin, the Group and its Power User members or the individual Power User are automatically granted Permission to use the configurable Data Source. To learn more about Configurable Data Sources, refer to: Understanding Data Sources. In order to Edit an Element, a Group's Power Users or individual Power User do not require access to the element's Data Collection Trigger. The Power User may only change the element's Trigger if he has Use or Edit Access to another Trigger or creates a new Trigger. If the element is sourced from a Dataset, the Privileges and Permissions discussed in the sub-sections below are required for Group Power Users or an individual Power User. In the Privileges section click [+ Privilege to Group or User]. The pop-up opens. Save your selection to confirm your action. Click [+ Dataset access to Group]. 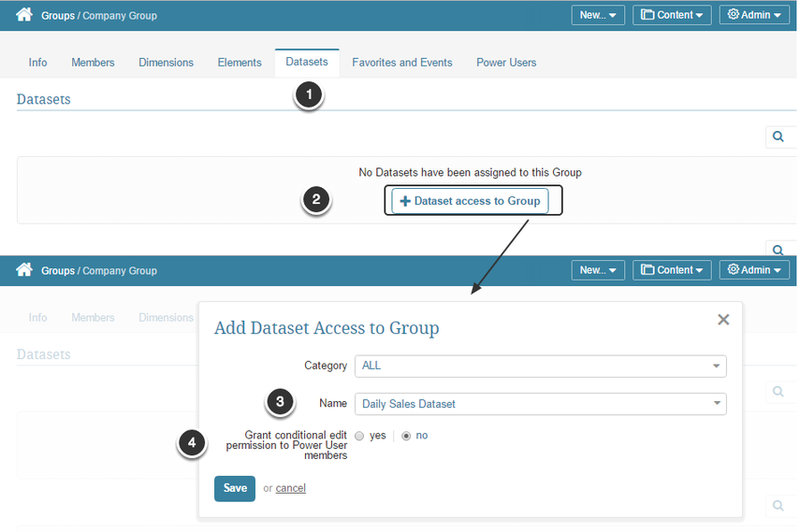 The Add Dataset Access to Group or User pop-up opens. Set can edit dataset to 'no' since only View Access is required; however, if Edit Access is granted to the Group or individual Power User, its Power Users have access to all Dataset Data even if a User Map is applied to the Dataset. Save your selection to confirm your actions. This requirement is relevant only if an User Map is applied to a Dataset. For more details refer to: Create an User Map and Apply an User Map to a Dataset. A non-configurable Data Source may require a Privilege and/or Permissions to make it possible for the Group's Power Users or individual Power Users to edit the related element. To learn about the nature of Non-Configurable Data Sources, refer to Understanding Data Sources. If the element is sourced from one of the following, the Group's Power User members or individual Power Users must have the related Create Content Privilege. The Group or each of the Power Users must have access to the source element(s) as noted below. Group (or Power Users individually) must have View Access to the source Metric(s) given at Group Editor > Elements tab > [+ Element access to Group or User]. Power Users do not require View Access to the source Report(s). This is an exception to the component element View Access requirement. Group (or Power Users individually) must have View access to the source Report given at Group Editor > Elements tab > [+ Element access to Group]. Group (or Power Users individually) must have View Access to the all of the source Metrics from which this element is aggregated, granted at Group Editor > Elements tab > [+ Element access to Group]. Group Power Users or individual Power Users individually must have View Access to all of the source Metrics, granted at Group or User Editor > Elements tab > [+ Element access to Group or User]. If the element is dimensioned, the Group (or Individual Power Users) must be granted access to at least one Dimension Value of the Dimension associated with the element. If a User Map is applied to a Dataset, iat least one entry for each Group Regular User must be included in the User Map associated with the Dataset. If the element is a Multi-Metric, Aggregate or a Composite Element: Permission to View source component elements. If element is Dimensioned: access to at least one Dimension Value of the Dimension associated with the element or to the whole Dimension.